Imagine getting up in the morning and looking at that view over your bowl of cereal! Stunning, isn't it? 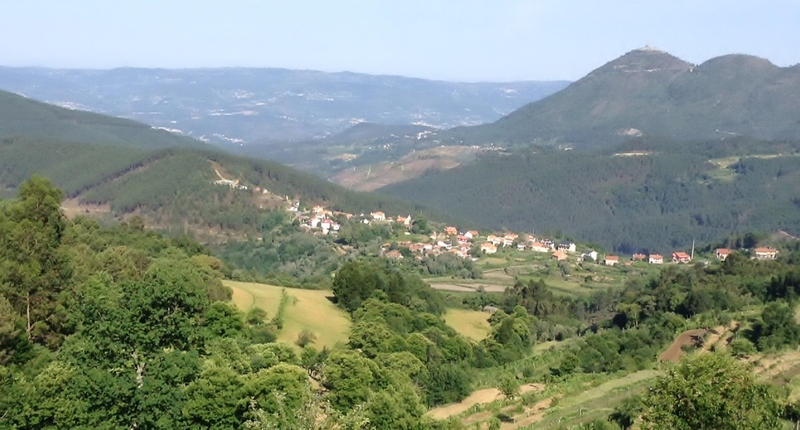 It was ours for a couple of days when we took a quick side trip to the Parque Natural do Alvão – a beautiful protected area near Mondim de Basto in the western part of Tras os Montes, just over the border from the Minho. Now screw up your eyes and peer at the hill on the right. Can you see a little dot of a building? It's the 18th century sanctuary of Nossa Senhora da Graça – Our Lady of Grace. We were told that from there the view was even better. Hard to believe, but true. So what has this got to do with 'Mamils' and Rui Costa? Click here to find out. After breakfast off we set. My husband suggested that we might park at the bottom and walk up the hill but – as it turned out, luckily – I had slept badly the night before and couldn't face it in the heat. We certainly hadn't reckoned with the long, steep climb round and round the hill to the top. I would never have made it but the local cycling club had more guts than me. 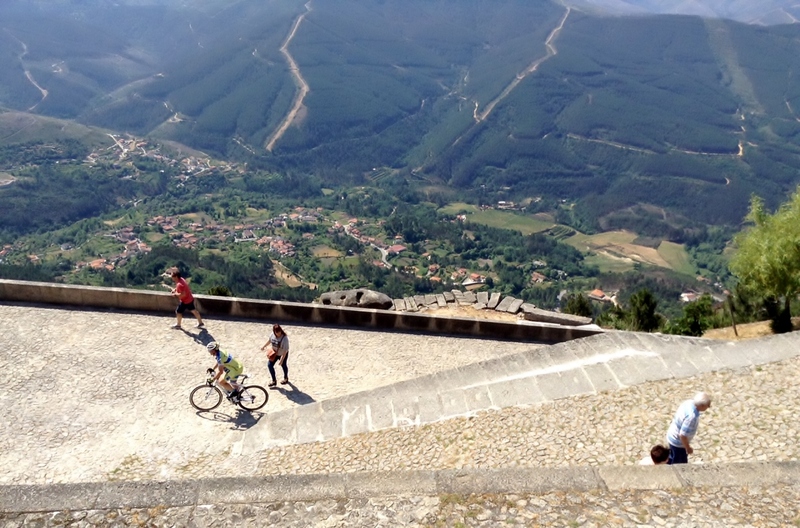 This ride is one of the challenges on the Volta a Portugal, the Portuguese version of the Tour de France, and a favourite outing for 'Mamils' - Middle Aged Men in Lycra - resident in Mondim de Basto and its environs. It's a gruelling climb by bike and some were flagging. Others, sensibly, stopped at a fountain to drink. As we reached the top, two cyclists drew up beside us. 'Parabens!' – Congratulations!' I said. 'Thank you,' said a short, remarkably portly man with enormous calf muscles. 'I found it easy. But my mate here....' – and he indicated his slim, beanpole of a companion – 'he had trouble getting up the hill.' The beanpole grinned and strode off to join some companions relaxing in the shade by the granite church leaving the tubby man plodding in his wake. 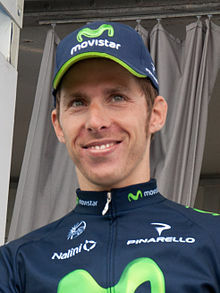 It seems that just as Bradley Wiggins and Chris Froome have created a love of cycling in Britain, spawning a hoard of mamils, in Portugal the 2013 world champion Rui Costa and this year's Tour de France cyclist Nelson Oliveira have done the same. We took a quick look inside the sanctuary but didn't like to disturb those already there praying and so went out to the little café and bought a couple of ice creams. It was truly very hot indeed and despite the height, there wasn't a breath of wind. And where were our sun screen and our hats? Back at the cabin we were staying in. If you do this trip, have a little more forethought than we did! Then we looked at the view. 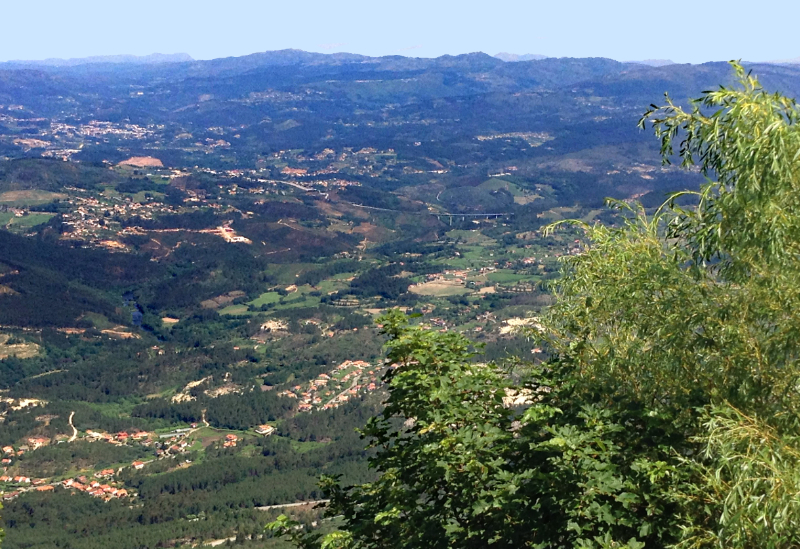 Rarely do you find a truly 360° view but from the sanctuary of Nossa Senhora da Graça you really do. For scores of kilometres in every direction it is spectacular. When I commented on this to a Portuguese friend he looked slightly bemused. "We're used to it, you know," he said. Used to it? USED TO IT? How could you ever be used to such glorious views? An English friend with a home near us sees things differently. He hasn't bothered to buy a TV. "That's my TV," he says, sweeping his hand round to show the view from his window. We weren't the only ones to take the easy way up. 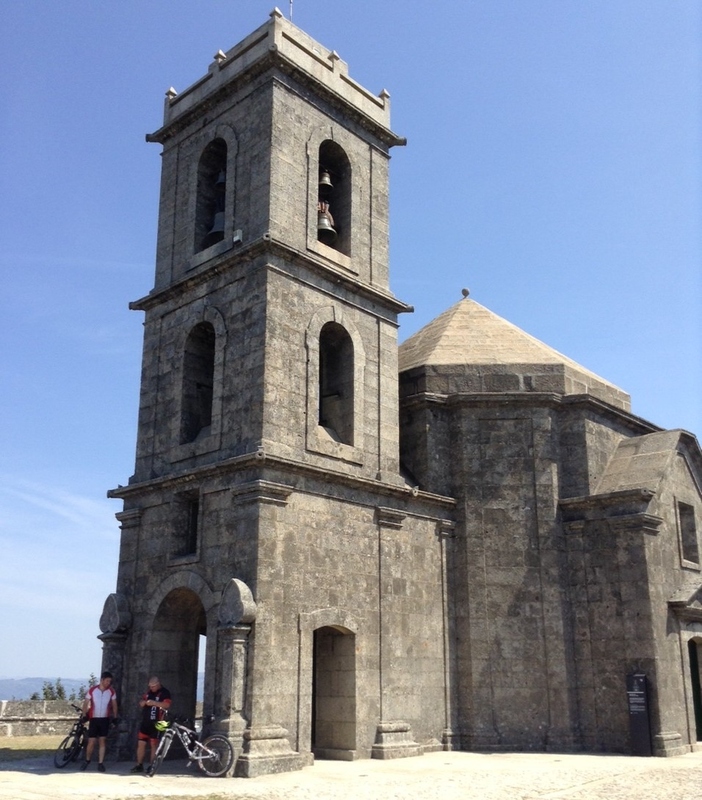 As we left a couple of coaches drew up with pilgrims aboard so we congratulated ourselves on having seen the sanctuary, enjoyed the views and bought our ice creams before the queues formed. There are other ways of keeping cool than buying ice creams in the Serra do Alvão. I'll tell you about them another time, perhaps.